Growing up in Canada I was an avid history student, and willing to read anything about the world. As for Cambodia, all I’d read and heard about that far-off country was that it was a place you should avoid. The country was presented to me as another one of those Third World battlefields caught in the Cold War conflict, used as a pawn and tossed around between ideologies after the Second World War. I knew a little bit about Polpot, the brutal dictator who on the pretence of setting up a socialist paradise in the late 1970s, imposed a tyrannical regime on the Cambodian people, and in the process savagely murdered over two million. I knew that after years of civil war Polpot had left behind a ruined and poverty-stricken country laced with land mines, which continued to take the lives of thousands of innocent civilians. This is what Canadian history books and my father, himself a history teacher, taught me about Cambodia. And this was how I saw it in my mind. “There are some places in this world that aren’t going to welcome you,” my father told me, knowing full well how much I wanted to see the whole world — whatever the consequences. I realized he was only trying to protect me, but we both knew I would go anyway if I wanted. Was I being naïve? Was I still holding on to the youthful idealism that I was invincible and would live forever? No, I was simply more concerned with what I would see and experience, what I would learn, than what might happen to me as a result of getting off the western couch, even if for a moment. I was willing to risk my own personal safety if I could get a closer view of the world, one that wasn’t dished out to me, edited for content and instilled with bias by media outlets like CNN. In my view, Canada’s eye on the world was too lazy and comfortable. I wasn’t satisfied by my place in the background, so I decided to cross borders. My interest in seeing Cambodia wasn’t just a matter of going somewhere forbidden. My intentions were to see the temple ruins at Angkor and whatever lay along the road that would take me there. And so, I found myself eventually in Asia, travelling southeast from Bangkok by bus. My plan was to give myself five days to spend in Siem Reap, a small city 10 kilometers from the ruins. We travelled by bus to Aranya Prathet, the Thai border town where all buses and trains stop. Cambodia has no trains of its own, and there is no way to avoid stopping at the border with the other tourists. You must endure waiting in sweaty lines, besieged by flies, in order to try to get a visa and pass through Customs as quickly as possible. The bus dropped us off in the middle of a street with no sign of a bus station or direction to the border. We hired a motorized tuk-tuk, telling the driver to take us to the border, but instead he took us a short distance to a makeshift travel agency. “Visa, you get your visa here,” said a small woman who approached us from inside the shop. We noticed some other foreigners, among them a couple travelling to Cambodia on their honeymoon from Scotland. They told us the situation appeared legitimate, so we sat at the desk and filled out our papers, trusting the woman who continued to smile at us as we filled out the forms. The process took a half hour, and from what my travel book explained to us, we were only paying a little more for the tourist visa than was listed in my book. The couple from Scotland had also booked tickets on a bus from the border directly to Siem Reap, and we agreed to do the same, believing this would save us the trouble of having to find transportation at the border, which I read can be an arduous pursuit. It was all becoming a matter of convenience, whatever brought us to our destination as quickly as possible. We disregarded the cost, which was easy to do considering that in Canadian currency we could hardly complain about the bargain the trip was. We were subsequently transported in a comfortable, air-conditioned tour bus to the border where we simply walked across into Cambodia with a few other tourists and many of the local people who were pushing and pulling large wooden carts full of goods. The border town was a buzz of activity, a crossroads of travellers, merchants, beggars, wanderers, guides, and hustlers. A guide approached us, applying a blue piece of electrical tape to our shirts for identification once we had passed through to the other side. Being asked no questions we presented our passports and were then hurried through the checkpoint to a second travel agency on the Cambodian side in the town of Poipet. This ramshackle border town is famous for its elegantly modern palatial casino which you get to by dusty dirt roads littered with the destitute and barefoot commerce. After waiting a few hours for the bus, we were taken to a small store where we were advised to exchange our Thai baht and other foreign currency for Cambodian riels as there were no foreign exchange banks in Siem Reap. A few of us fell for this ruse, later learning that there were many foreign exchange banks in Siem Reap and we had been ripped off. Fortunately I suspected this, and only lost a few dollars from the scam, but some of the others weren’t so lucky. We also learned from a Canadian ex-pat teaching in Siem Reap, that we had paid five times the reasonable price for our bus from the border to the city. He assured us that this often happens to western tourists coming from Thailand, and that we shouldn’t blame the Cambodian people; rather that it was the Thai tour companies who had arranged the bus that had ripped us off. The road from Poipet to Siem Reap was definitely the worst I have ever experienced; a dusty uneven trail full of gaping potholes, which although running only 150 km, took us eight hours to complete. The bus was bouncing crazily and narrowly avoiding the holes and ditches. The journey was further made an ordeal by the fact that our overcrowded bus was jam-packed with frightened tourists on rotting uncomfortable seats. The sharp metal springs of the seat in front of me grinded into my knees. Without air-conditioning on this bus or even any basic ventilation passing through the open windows because of the slow speeds at which we travelled, the 35-degree swelter engulfed us the whole way. Only on reaching Siem Reap did the road even out and something resembling a solid surface appeared under us. Arriving tired and frustrated, we went to sleep that first night wondering if we should have avoided what we were beginning to think was just a tourist trap. Our feelings changed the next morning, however, after our fabulous banana pancake breakfast, the warm atmosphere created by the family who ran our guest house, and the awareness that it was only little bit of money, and who better to give our money to than people who valued those few dollars more than we did. Siem Reap is the town closest to the temples of Angkor. While staying in its guesthouses, only 10 km away from Angkor, there remained a rural small-town atmosphere, however the situation is rapidly changing. On the road into the town, which serves as the national highway leading south to the capital, I observed several magnificent resort hotels, fronted with elegant fountains, gardens and palm trees. This was clear evidence of a booming tourist industry in response to the growing reputation of Angkor as one of the ancient wonders of the world. The Cambodian people are anxiously preparing their country for the tourist boom that has been a long time coming as a result of the stigma of being a backward country, and notable primarily for its bloody tyrant, brutal civil war, and a land of unharvested land mines. Tourism is the only hope for such an impoverished country trying desperately to emerge from its Third World status and become — at the very least — known internationally as “developing.” However, Cambodia was not always in this state. Angkor, for example, is composed of over 70 temples and architectural sites scattered over some 70 square kilometers of jungle, forest, and farmland. Nearly 1000 years ago it was the capital of an empire that ruled much of Southeast Asia. And so we set off to explore this ancient empire. We hired a motorcycle with a two-person carriage attached to the back for the equivalent of 10 dollars a day to take us from our guesthouse in Siem Reap to ancient Angkor. I opted for a three-day pass because I wanted to see the main sights, Angkor, Bayon, and Ta Prohm, but I also wanted to visit the less visited areas, and have some extra time to return to the sites I preferred for further exploration. By the end of the three days I realized you could spend at least a week visiting all the sites in the area around Siem Reap because so many temples have survived the centuries, protected in large part by the jungles which once covered and to a great extent preserved them. Only after years of painstaking restoration work clearing trees, brush, vines, and land mines from the area could the remains of the temples be opened to the public. Hiring a driver was an excellent way to explore and thoroughly enjoy Angkor. Having to walk 10 kilometers every morning just to reach the front gates would have gotten us there at the hottest time of day, and the distances between the temples were simply too vast to be reached on foot if you wanted to see as much as possible without killing yourself. Our driver (Tha), a pleasant and patient man who was always smiling, dropped us off and picked us up at the entrance to every temple, ushered us to restaurants, the bank, souvenir shops; wherever we wanted to go. He waited for us at every stop, sitting in the shade with the other drivers, often catching a nap while we explored. He spoke enough English to give us useful information about what the temples offered and what time was best to visit them in order to avoid the heat and the throngs of other visitors. We couldn’t have seen all that we did in such a short time without our friend Thal. He made our journey quite “do-able,”, and although climbing and searching through the temples was an exhausting experience, our adventure was also relaxing as we lay back in our carriage enjoying the breeze and the exotic jungle atmosphere. The Cambodian people know how to deal with tourists. At every temple there was a group of women with coolers offering cold bottles of water for a dollar each. And by the way, Thal explained to us that everything in Cambodia has a negotiable price, and that we shouldn’t pay more than a quarter, or 1000 Cambodian riels. The Cambodians are usually more willing to accept American paper currency, or even Thai baht, before they accept riels. The innocent-looking and charming children who came running up to us in bare-feet with beautiful smiles and glowing black eyes were especially well-trained to deal with tourists; at times heartbreakingly so. “Do you want a bracelet? I made it for you,” asked a sweet little girl who couldn’t have been more than six. “Do you want postcards?” some of the little angels would ask. “No, I’m sorry, I already bought some,” I would answer, trying to fend them off. “These ones are different, they would insist,” and would following us around until we gave in. “Where are you from?” they often asked. However, on one occasion, a tiny girl, maybe five or six years old, approached my girlfriend and held out a handmade bracelet to her. Before we could ask the price she uttered, “This is free for you because you are so kind and so pretty,” and she danced off to join her little friends. 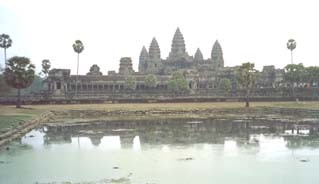 The first site we visited was Angkor Wat, the central attraction among the more than 70 temple sites in the area. Our driver took us along the moat that surrounded the complex. The sandstone and laterite structure was built in the 12th century by King Suryavarman II of the Khmer Empire. Although resembling a massive palace surrounded by a protective wall and moat, “Wat” means temple, and the vast site was constructed as a religious sanctuary for funerary purposes. Angkor Wat took over 30 years to build and is today recognized as the largest religious building in the world. 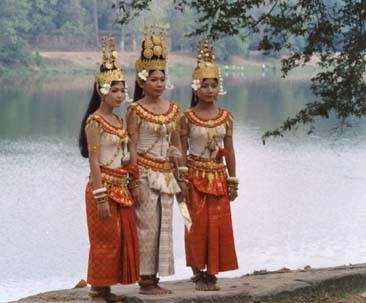 The kings who ruled most of Southeast Asia from the capital at Angkor from the ninth until the 15th century were worshipped as devaraja or god-kings by their people. 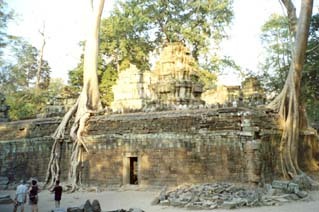 The Khmer Empire and the architecture which remains represents a mixture between Buddhism and Hinduism, an influence which varies depending on the spiritual beliefs of the ruler. Angkor Wat itself was dedicated to the Hindu deity Vishnu, often represented in human form with four arms. It is Vishnu who always comes to the rescue of humanity. The interior grounds of Angkor Wat can be reached by a massive stone walkway that crosses the moat and is guarded by the stone naga, mythical multi-headed serpents lining this path into history. The inner walls reveal the longest bas-reliefs in the world, exhibiting scenes from epic Hindu literature: eternal battles between gods, demons, and mythological creatures. The most famous of Angkor Wat’s reliefs is the “Churning of the Sea of Milk.” It portrays gods and demons engaged in an eternal tug-of-war, pulling the serpent naga between them. The struggle is being presided over by Vishnu, here portrayed as a giant tortoise. The conflict has brought chaos to the universe, while producing life’s sacred elixir, infused with the gift of immortality. While centuries have passed and curious onlookers from all over the world have come and gone, these mythical depictions live on, having survived age, looting, civil wars which destroyed many of the treasures, and having been hidden in jungle foliage for hundreds of years. From Angkor Wat, the main road takes you to Angkor Thom, or “great city,” a huge walled-in area that contains some of the most popular and impressive ruins at Angkor. 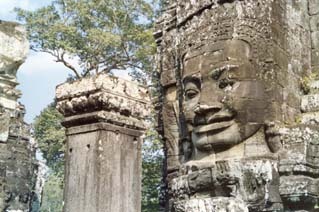 The southern entrance to Angkor Thom is a road lined with 54 statues of demons carrying a great serpent. The tower gate under which you pass is an all-seeing four-faced stone deity who smiles down at you ominously. In the exact center of Angkor Thom is the Bayon, the name of the four-sided towers decorated with giant smiling faces that cover the multi-leveled complex honoring Buddha. Unlike Classical Greek sculpture, the carved faces are not idealized or stylized, and a strange feeling overcomes the visitor when you realize that you’ve seen these faces before; you've seen them riding around town on motorcycles and working in the rice fields and markets of Siem Reap. These are the faces of the people who built Angkor, the same faces of the people still living, working, and surviving despite the land mines and food shortages. Observers have described the somewhat enigmatic faces as amused, detached, even sympathetic. Others point out that they represent the face of Avalokitesvara of Buddhist lore, the Boddhisattva or spirit of compassion who declined entry into Nirvana until all other souls on earth were enlightened. A trip to Cambodia’s rural schools will also show you these faces; children dressed in the pristine white and navy blue uniforms of Siem Reap’s school children. 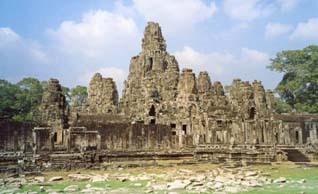 The Bayon’s reliefs, which cover the walls between the many dark doorways in the multi-sided core of the temple, portray everyday scenes of the Angkorian people fishing, hunting, playing chess, and fighting battles with rival kingdoms. Further north in Angkor Thom is the Terrace of Elephants, a 300-metre stone stage on which the Angkorian kings used to sit with their courtiers, observing military processions and religious ceremonies. Emerging from the stone wall is a great parade of bas relief elephants, an animal popular as a symbol of royalty throughout Southeast Asia, and often adorning royal palaces and religious buildings. East of Angkor Thom on the central route is Ta Prohm, built by Jayavarman VII as a Buddhist temple in memory of his mother. Approaching the temple I could hear rhythmic instrumental music being played nearby. It was a six-piece band, set up off to the side of the path to the temple. Six men were seated in a half-circle on wooden skids. On the ground beside them was a sign, which in Thai and English read “Victims of Land mines.” These were farmers and workers, helpless victims to the hidden killers planted during the civil wars. Each musician was maimed or disfigured in some way; a few of them blind, a few missing limbs, fingers, feet. In order to make a living they played traditional Cambodian music, earning money from tourists who came to see Angkor. 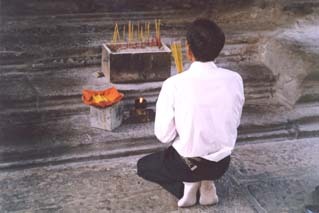 The sound of their traditional Khmer instruments and rhythms filled the nearby temples with a beautifully calming sound. All the musicians, whether blind or not, played with their eyes closed. Some of the younger Cambodians who were maimed by the land mines stood around the temples offering their services as guides, making their way up and down the steps on prosthetic limbs and with the use of canes. They were more than willing to tell their tragic stories and educate tourists about the horrors and legacy of Polpot, a name that in this country is now akin to profanity. Although the mines have been cleared in the densely populated and tourist areas of the country, these hidden horrors are still killing and disfiguring many Cambodians in parts of the northeast. Unlike Angkor Wat and the Bayon, which are recognized for their grandeur and decoration, Ta Prohm is unique, having only been partially covered by the surrounding jungle. Giant trees, some as old as the buildings themselves, grow wildly among the ruins, the roots often creeping between the bricks and over the walls. The great white trunks resemble giant creatures stepping dinosaur-like over the walls and reaching through the doorways and windows almost gracefully, with long white finger-like appendages. Ta Prohm is a complex that blends nature with human creation. It has suffered from the passage of time, and yet remains resilient in a primitive harmony of wood and stone. In many places the massive trunks appear to be holding up the walls, while also attempting to reclaim their plundered heritage. Ta Prohm is the most haunting, surreal, and ethereal of Angkor’s sites. It took me less than a week to realize that Cambodia is in fact a country you should not avoid. The local people we met in guesthouses, restaurants, markets and at tourist sites made us feel very welcome. I came away with an overwhelming desire to take the entire country in my arms, empty my wallet, and bring more people with me on my next visit. These people have emerged from horrific atrocities and degradation, but with a determined desire to develop their country and get their share of its rich resources. Cambodia offers a gorgeous tropical climate and landscape with some of the most incredible ancient ruins in the world, all at bargain prices. And the sincere hospitality is more genuine and more familial than any I’ve encountered anywhere in the world. On the morning we left our guesthouse, the matriarch of the family who kindly tended to all our needs, presented each of us with a traditional Khmer scarf she had made herself. Back home in Canada, I hold her precious gift in my hands and am reminded of why the “developing world” deserves so much more than our pity. They deserve more than simply being read about in some travel magazine. What can we do for this beautiful nation? 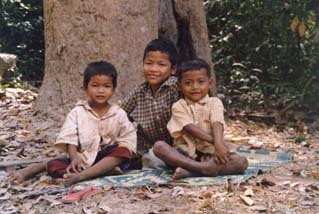 We can start by going there and discovering the real Cambodia. In terms of personal security, I can say that I felt safer in the jungles of Cambodia than I do on some North American city streets. Don’t worry, the Cambodians will take care of you. Gregory Monteith is a writer of novels, poems, plays and short stories. He has recently immersed himself in the field of travel writing. Since graduating from McMaster University (Hamilton, Ontario, Canada) with an Honours BA in History, he has backpacked through over 14 countries in Western Europe, North Africa, and Asia. 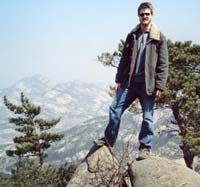 Having recently returned from a year of working and travelling in China, Gregory has again returned to China where he is teaching History, Geography, and Writing at a private college in Beijing. According to Gregory, he may someday find a permanent home, but for the moment he is content, in his “restless youth,” to live his life as a citizen of the world.